Thornburg, Virginia (September 24, 2017) – The Super Cup Stock Car Series made their long-awaited first ever stop at the immaculate Dominion Raceway and Entertainment complex and gave fans that came out a show worth talking about. The inaugural SCSCS 75-lap non-points special event presented by Avatar Instruments saw Bob Schacht as the driver to beat throughout the afternoon, quickest on short practice runs and claiming the Pole Award with a best time of 15.882 seconds. 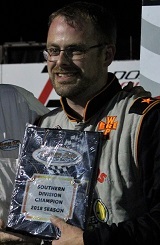 2017’s Top Performing Rookie recipient Jerod Brougher made the six-car redraw for the first time in his career and ended up leading the 15-car field to green. Almost immediately, Schacht marched from his fourth starting position toward the front, but not without a fight from outside pole starter Ben Ebeling. 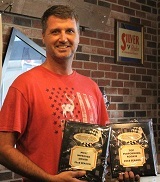 Ebeling, a winner at Lonesome Pine in early August, successfully gained sole possession of the top spot and led for numerous circuits. As the halfway distance approached, Schacht steadily closed in on Ebeling and the No. 75 Engineered Components nosed under the No. 44 Wrench Rags / Custom Graphics Ford at the line. Out of turn two, Schacht rocketed into the lead. A yellow flag on lap 40 for Craig Wood, making his first SCSCS start since 2011, bunched up the field and set forth a noticeable change of events. When the race resumed, Schacht unusually drifted high on the front stretch, nudging Ebeling toward the wall, and allowing Kevin Kromer to dive below both to take the lead. Both frontrunners regrouped following a red flag after an extreme impact for first-year SCSCS driver Ron Langdon into the turn four outside wall. The Freeport, New York racer was okay. Schacht searched everywhere on the 4/10-mile surface before regaining the lead from Kromer on lap 47. 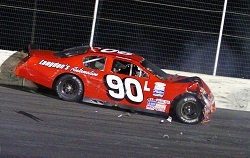 The next time by, Ebeling caught Kromer and the two tangled, sending Kromer for a 360 in turn two. Once both were sent to the rear of the field due to the contact, Brent Nelson was given a shot at Schacht. 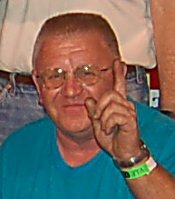 The Petersburg, West Virginia driver’s best chance came on a restart with 10 laps remaining when he drew even with the No. 75 for the opening lap of the final green flag run. Nevertheless, it was Schacht who powered ahead enough to claim his first SCSCS checkers. 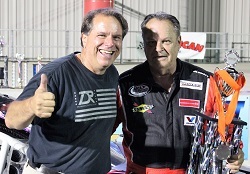 It was a long time coming for the Mooresville, North Carolina driver who won 19 times during his storied ARCA career, but had not found it too easy to seal the deal since joining Super Cup. 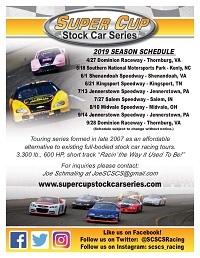 It was also announced during race day that the Super Cup Stock Car Series will be opening and concluding their 2018 season on Saturday, April 28 and Saturday, September 29 at Dominion Raceway, a move Schacht and several more applauded. “I hear that we’re going to come back and start the season here and going to finish it here; I think that’s a good plan because it’s an awesome place,” Schacht commented. Nelson had been looking forward to this event for months and despite coming up a position short was satisfied. Veteran racer Mike Potter quietly had his best result to date in third without one bit of damage on his self-owned No. 12 Chevrolet. Kromer rallied back to a fourth place finish, while Ebeling salvaged a fifth. Both drivers had differing accounts regarding what had happened earlier on. 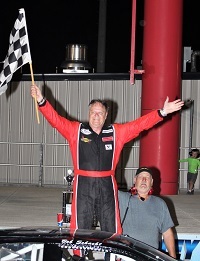 After all was said and done, Kromer still saw many positives upon simply being at the track and having the opportunity to race on his one-year anniversary of being cancer free. 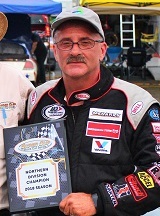 Brougher wrestled back from overheating issues to return to the lead lap and finish in seventh during the main event, resulting in a third place starting position for the 25-lap Extreme Awards and Personalization Trophy Dash that followed for competitors who have yet to win in the Super Cup Stock Car Series. Brougher who motored inside for the top two spots at the completion of the first circuit. A few laps later Brougher took the lead on the outside and began to lengthen the margin, but an interesting final lap set up a last ditch effort for Richardson coming to the checkers. The 30-year-old driver of the No. 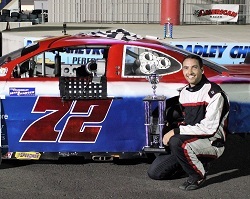 72 Donegal Auto Body / Parry Custom Homes Chevrolet saw all of the hard work put into completing his first season pay off after a debut that started off sluggishly due to issues not necessarily of his own doing. The variety taking place in the 10th Anniversary season demonstrates an exceptional record of nine different winners in 10 races held. 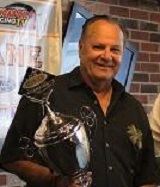 Many of those already triumphant competitors and a number more searching for their first victory of 2017 will receive two last chances when the Super Cup Stock Car Series makes their initial visit to Highland Rim Speedway outside of Nashville, Tennessee on Saturday, October 14 for Twin 50-lap special events. 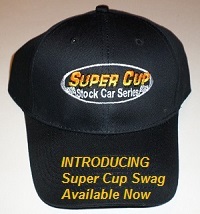 Please visit the official web site at www.supercupstockcarseries.com and Facebook or Twitter accounts for more information regarding the Dominion Raceway Inaugural SCSCS Race presented by Avatar Instruments and upcoming events remaining in 2017 and being planned for 2018.